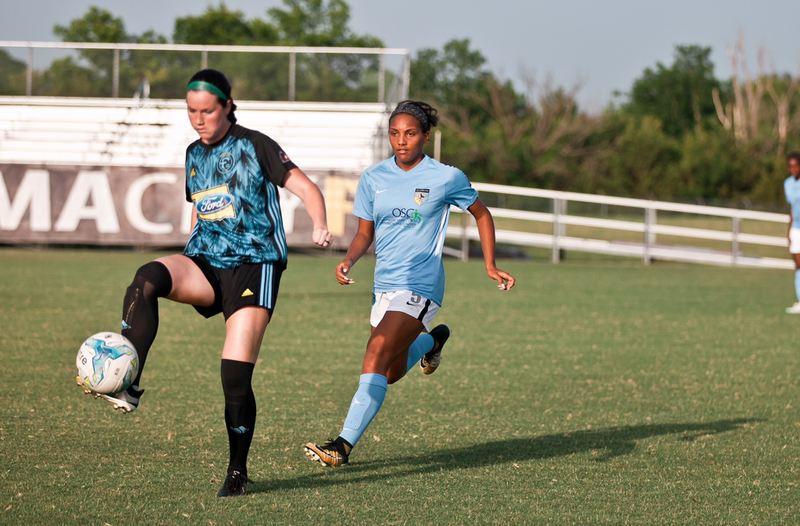 NORMAN — Yazmeen Ryan scored the equalizing goal from a free kick in the 85th minute as Oklahoma City FC rallied to tie Fortuna Tulsa 2-2 at Bryan Young Memorial Field on Monday night. With the draw, Oklahoma City FC won the inaugural Turnpike Cup based on its 1-0 victory at Fortuna on May 25. Ryan (Norman/TCU) scored on an incredible free kick, a 20-yard strike that curled over the Tulsa wall and into the top-right corner of the net. Fortuna keeper Paige Hobart (OU) was motionless, for the strike was placed in the only spot of the goal she couldn’t reach. The goal was two days after Ryan scored the match-winning goal in stoppage time during Saturday’s 2-1 win at Texas Spurs FC. Erika Yost (OU) scored Oklahoma City’s first goal in the 69th minute with a left-footed shot inside the box. The match was scoreless in the first half, but Fortuna’s Sierra Schwarz quickly broke the tie with a header flicked over Oklahoma City goalkeeper Allison Austin’s (Norman North High School) in the 46th minute. Schwarz then assisted Renee Wilson’s goal in the 56th minute, which gave Fortuna a 2-0 lead. The result moved both Oklahoma City FC and Fortuna Tulsa into a three-way tie with FC Wichita for second in the standings. FC Dallas has already clinched the WPSL Southwest Conference title. Oklahoma City FC concludes its season Saturday at Little Rock Rangers. Kickoff is at 5 p.m. from War Memorial Stadium. ©2019 Oklahoma City FC / SportsEngine. All Rights Reserved.